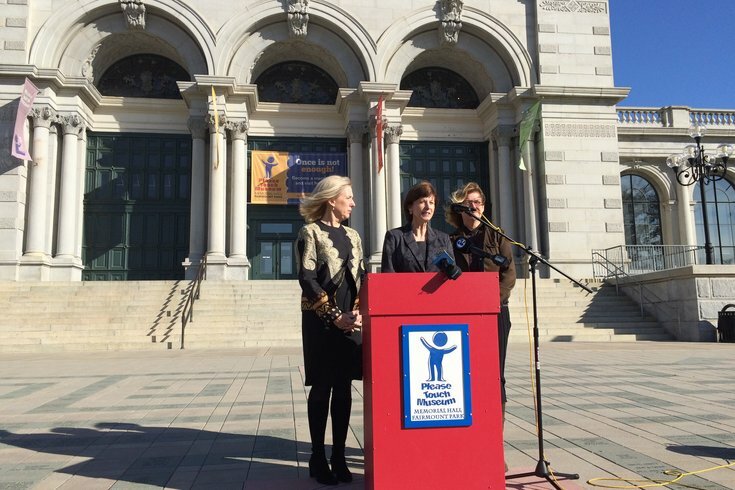 Flanked by the Please Touch Museum's new CEO Trish Wellenbach and current CEO, Lynn McMaster, Sally Stetson, chair of the museum's board of directors, announces new funding into the museum's fundraising campaign and McMaster's impending departure. Philadelphia's Please Touch Museum shared two announcements Tuesday morning intended to help the nearly 40-year-old, child-focused educational attraction climb out of bankruptcy. An anonymous donor has donated $3.25 million to the museum's fundraising campaign, boosting the total collected to $4.86 million of the $10 million goal, according to Sally Stetson, chair of the museum's board of directors. Stetson also introduced Trish Wellenbach, who will step in as CEO of the museum "once we emerge out of bankruptcy," Stetson said. The museum's current CEO, Lynn McMaster, said she is stepping down in order to spend more time with her family, as her husband has recently landed a job in Toronto and she's looking forward to moving to America's northern neighbor. "It's important for me to be with my family," McMaster said Tuesday. But McMaster said she likely will stay on until March to help transition Wellenbach into her role as CEO and help reach the $10 million fundraising goal. "We've done too much work here to see it founder in any way," said McMaster. "I'm going to be a mentor to her." Though Wellenbach was only hired two weeks ago as a special advisor to the CEO, McMaster said that Wellenbach has a relationship with the museum that goes back at least three years. She has worked to help the museum with its current strategic plan. "This is a terrific opportunity," Wellenbach said. "I'm honored to have the torch passed to me." McMaster has been with the museum since 2012 and was named CEO in 2013. In September, the museum announced a settlement with bondholders, and declared bankruptcy. Stetson said the museum went into debt in 2008 after moving from Center City to its current home in Memorial Hall in Fairmount Park. The move coincided with the recession, and donations to the museum fell off. "That's when everyone just stopped giving," she said. According to Stetson, the museum counts on donations to cover about 15 percent of its annual operating costs. In the next few weeks, the museum plans to open the fundraising campaign to allow the public to contribute toward the fundraising goal. There will be no minimum that individuals can donate, Wellenbach said. "A dollar is fine," Wellenbach said. "Sometimes a $5 gift is just as important as a $5,000 donation from someone else."